There’s a special place in heaven for women who help other women. Despite receiving only 2% of VC funding, research shows women consistently under-promise, but often over-deliver. They are wiser with money and create higher returns, larger payrolls and more jobs. As female founders of nonprofits ourselves, we identify with these same statistics. *So don’t despair! Join us. You’ve got creative ideas; we’ve got business needs. Let’s boost our opportunities to overcome the odds. Let’s do it for ourselves and for the millions of women who need our help. A female-led nonprofit creating jobs for people living in extreme poverty. TAP provides the most-effective solutions for combating the climate crisis, empowering women and creating sustainable solutions towards ending extreme poverty in our lifetime. We know how to do it. And we’ve enlisted thousands of people to join us. But we need millions. We’re counting on some creative women (ahem…) to help. We’re not your typical charity. For a reason. Thousands of charities were drilling wells, yet over a third of wells in Africa are currently broken (Yes. Over. One-Third!). Enter Becky’s aha moment: instead of drilling more wells, why don’t we start an organization dedicated to training people locally to get a job maintaining them? We’d be supporting “ventures that add something positive to the world” (get it?) So The Adventure Project was born. No surprises here. But working, works. Over the last 8 years we’ve seen that when people are hired they buy more food for their families, send their kids to school and serve their communities. Thanks to thousands of incredible supporters who have joined us, we have hired over 1,600 people in six countries. Together those entrepreneurs serve over 1.3M people every day. From well mechanics who fix broken wells, to health care workers who treat pregnant moms - the jobs we create are transforming communities and strengthening economies. Rabecca with her daughter. 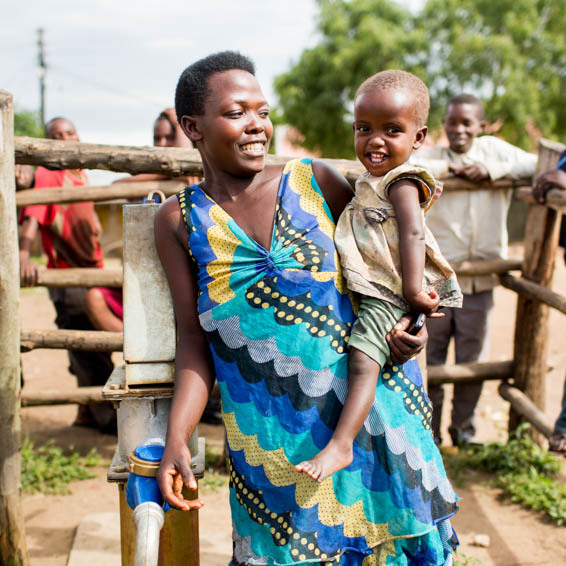 She was hired as one of the first water caretakers in Uganda. From the climate crisis to ending extreme poverty, we are working on big, bold issues. We need an integrated marketing campaign tackling these issues head-on. We’re brave. We’re brazen. We’re in need of a campaign that cuts through the noise and wins. Period. You won’t just be helping our female-founded team, you’re helping thousands of women in developing countries get jobs that transform their lives. We’re not just a charity case. We mean, sure, pro-bono is always the way to go. But last year we were able to win $1M from the Pineapple Fund to grow our org. (and then our CEO gave birth 3 weeks later… because that’s how we women roll). So we have some of those funds we’d like to allocate to advertising. We also have a strong list of corporate partners lending their services (Google, Facebook, Pinterest, and ad space from Xandr). Working with you would be heavenly.